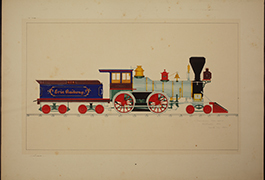 The William Halsey Locomotive Drawing Collection, held by the DeGolyer Library, contains 84 watercolor drawings by William Halsey (born ca. 1845- died ca. 1900), a railroad enthusiast probably working in the New York region as early as 1863 until the 1890s. DeGolyer Library digital collections are part of SMU Libraries Digital Collections, which contain thousands of digitized photographs, manuscripts, imprints, and works of art held by SMU Libraries' special collections. The digital collection is based on the William Halsey locomotive drawing collection held by the DeGolyer Library. 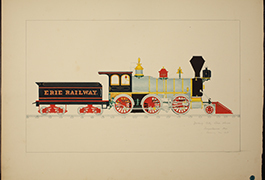 The ink and watercolor drawings depict locomotives and tenders primarily built or purchased by the Erie Railway between 1863 and 1876. Also included is one Lehigh and Susquehanna Railroad locomotive drawing. The drawings provide a comprehensive study of locomotives of the New York state region in the 1863-1875 period. The collection consists of 84 drawings on 81 sheets. The images are realistic in proportion and detail, and they correlate with photographs of the same or similar locomotives of the period. 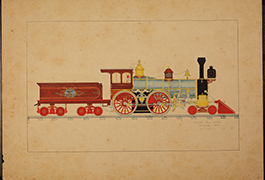 All of the drawings include the locomotive and tender. A finding aid to the collection is available in the Texas Archival Resources Online. A significant aspect of the drawings is the record of colors and paint schemes used at the time. Some of these drawings represent the only records of this form of applied decorative railroad art to survive. As a group, the engines display a wide range of colors, and frequently display schemes indicative of locomotive builders or the shop’s style that maintained them. Colors vary from one Erie shop to another - Hornesville Division engines have a single wine red scheme, Susquehanna Division locomotives vary widely, Eastern Division had common colors but individualistic styles. This relates to the individualistic nature of the managerial structure, rarely visible in such complete form as in this set of drawings. Information on each drawing is written in graphite underneath the image. Although uncertain, it can be assumed that this was done by the artist. The dates recorded here are most likely the dates that the locomotives were manufactured or refurbished (1860s and 1870s) and not the dates of the drawings since watermarks on the paper date from later periods, even as late as 1896. The William Halsey Locomotive Drawing Collection is one of a family of digital collections from the DeGolyer Library that focuses on Texas, the U.S. West, Mexico, and Latin America. Many of these collections contain photographs of railroads, locomotives, trains, and depots.